Insurance is the most basic need of individuals as well as businesses these days. As insurance is the only thing that can keep anyone protected from sudden mishap or damage. With the rise in the need of different type of insurance services, the number of insurance companies has also grown tremendously with unique and best option to offer. Most of the companies let customers fill insurance assessment forms to have a best possible insurance option for them. If you are in the insurance business and want your organization to offer pre-assessment to customers then Assessment Forms templates can help you with this. These forms help insurers understand customers’ requirements clearly and thus offer a best possible quote. Let’s have a look at different types of forms like health risk assessment forms, travel risk assessment forms and more that you can try. Get this insurance risk assessment form downloaded for your insurance company and carry out a kind of thorough survey on your customer’s insurance needs. 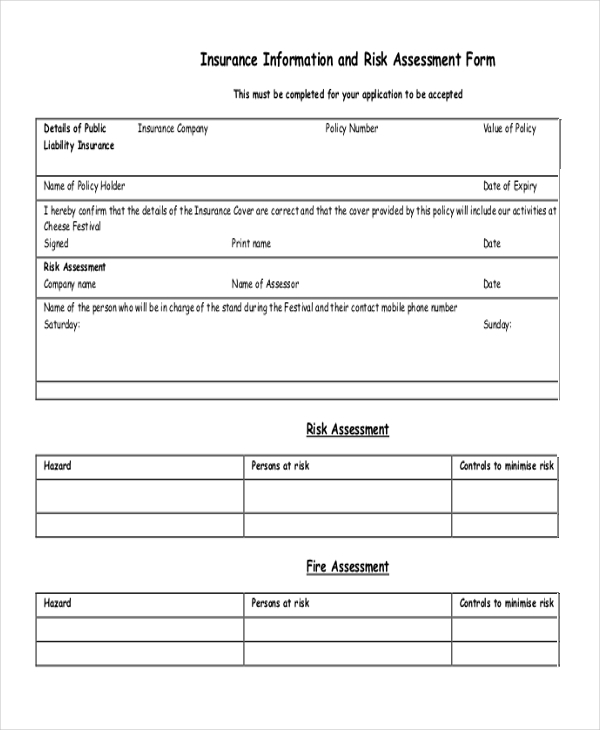 This risk assessment form will enable you to explore complete information about associated risk with the client or his/her property. Want to understand your customers’ insurance needs thoroughly? 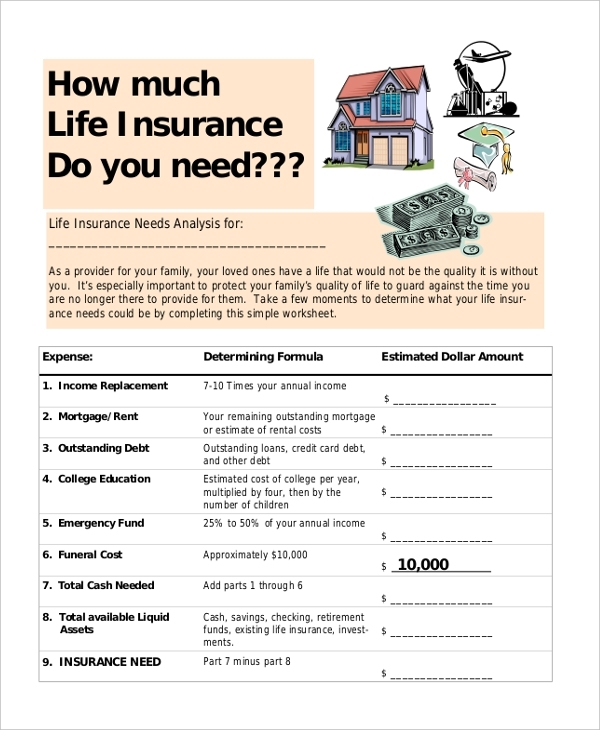 Get this insurance need assessment form downloaded for your insurance business and ask your clients to fill this completely. It will enable you to offer a best possible quote to your clients. Get this insurance pre-assessment form downloaded and use to explore your clients’ insurance expectation from any insurance provider. 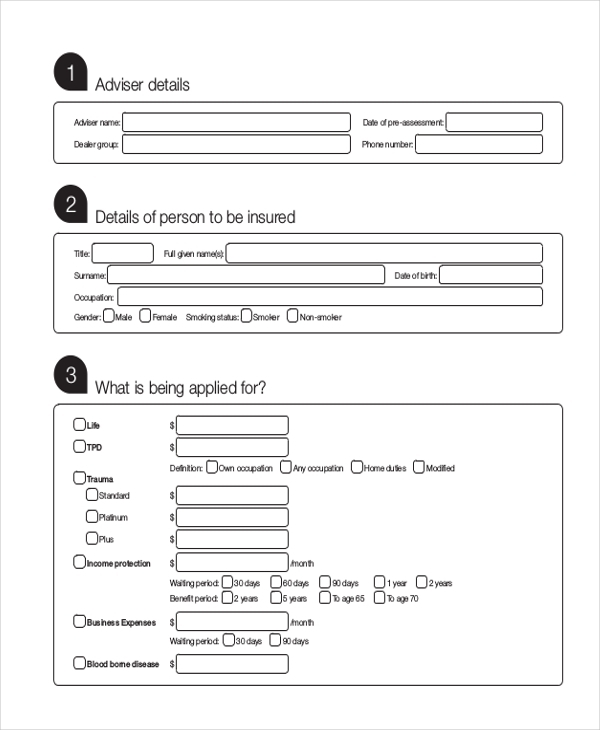 This form can be used before offering any quote to a prospect in order to understand his/her insurance requirements. 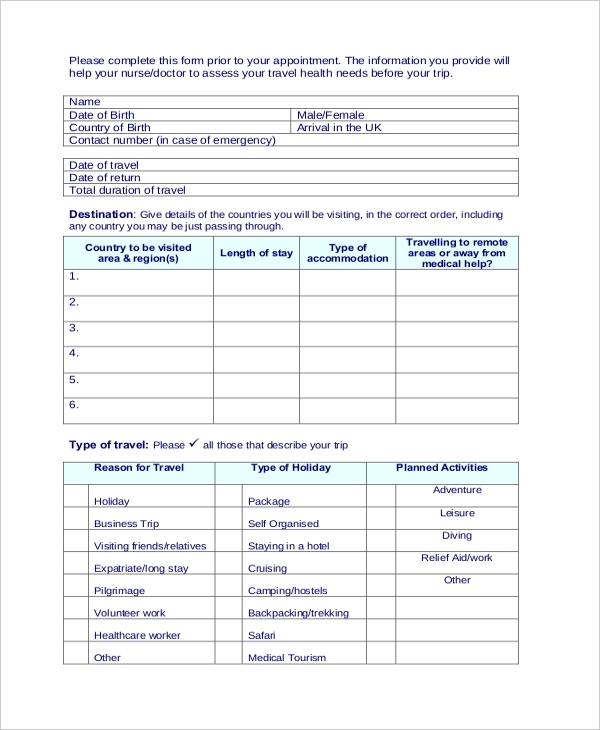 Here is another travel insurance medical assessment form available online for download that is ideal to be used by insurance service providers for assessing clients’ travel risk assessment requirements. Available in PDF form and can be customized as per your business needs. 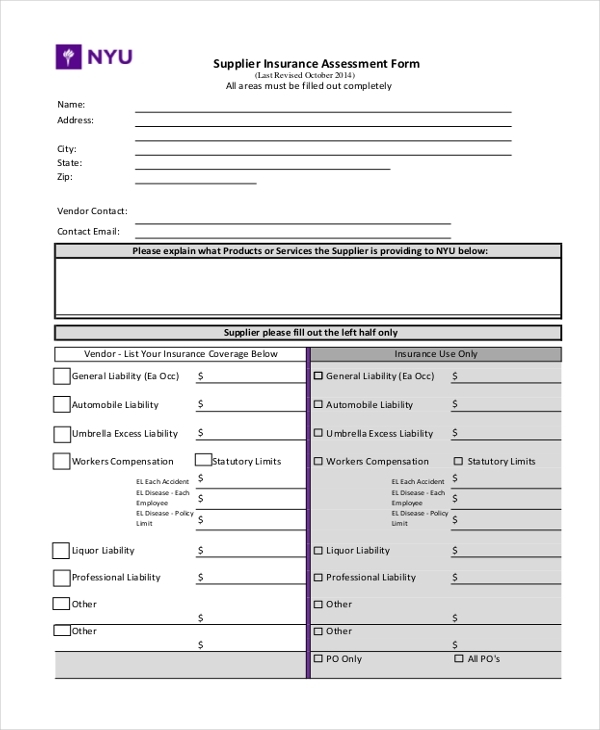 Get this supplier insurance assessment form template downloaded and understand the risk associated with the clients’ property that he/she may claim. This form is ideal to help insurers understand clients’ requirements and thus offer the best solution. 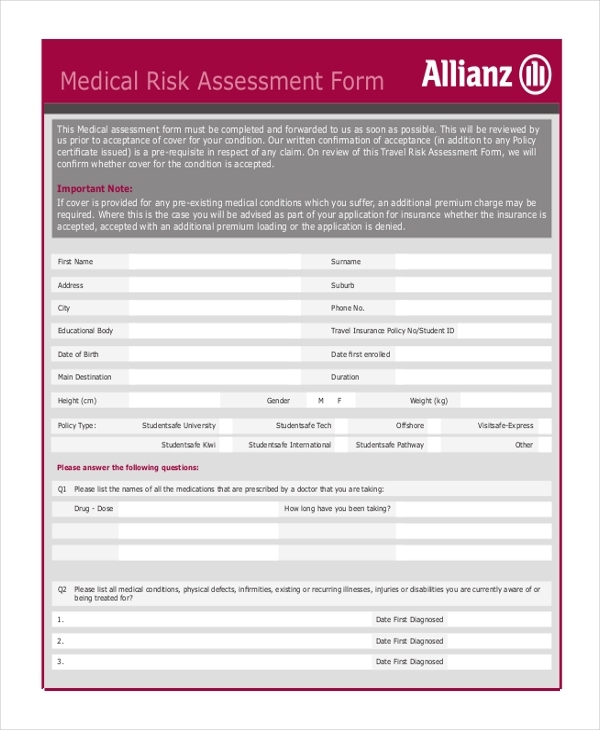 Whether you are an insurance provider or any organization that wants to have an idea of medical insurance risk assessment for your employees, this perfect medical risk assessment form can help you carry out an in-depth insurance evaluation and thus calculate the claim amount. Assess the insurance premium of your various clients by using this professional insurance premium assessment form available in PDF format. It can be customized as per your particular needs. Download now. What are The Utilities of Insurance Assessment Forms? Before providing any insurance cost to clients or prospect, insurance companies or advisors need to assess the business or individual insurance requirement of the client. This assessment helps them understand the various risks associated with the client. For the sake of carrying out these assessments, various insurance providers utilize these insurance assessment forms. Customers or prospects are asked to fill these forms and provide the details of the individual or the property for which they seek insurance service. By understanding clients’ needs an insurance company can offer best insurance scheme or quote to its customer and which in turn will help provider to enhance their reach and attain business goals. You may also see Job Assessment Forms. The target audience of insurance assessment forms is majorly insurance companies, advisors, brokers and insurance providers that want to have an idea of a prospects insurance requirements in advance. An insurer would most probably ask its customer to fill insurance assessment form to have an idea of clients’ exact requirements. In addition to insurers, various organizations, offices, as well as business that offer medical and travel insurance benefits to their employees, also comes into the target audience of insurance assessment forms. As these also need to assess employee’s insurance requirements like a medical condition or ailments in the case of medical insurance etc. before offering any kind of insurance service. You can also see Health Risk Assessment Forms. What are The Benefits of Insurance Assessment Form? There are countless benefits associated with the use of insurance assessment forms. Here are a few of them. Easy usability and availability of insurance assessment form templates are the major benefits that these can offer. These form templates help you save your huge amount of time as everything comes designed and framed perfectly into a file and you just need to make little but customizations in the text. These insurance assessment forms help insurers understand the clients’ insurance requirements clearly and thus offer best possible cost the customers. With the important information provided by customers through insurance assessment form, an insurer can calculate insurance premiums more accurately and easily and thus prepare the most appealing cost to its customer. 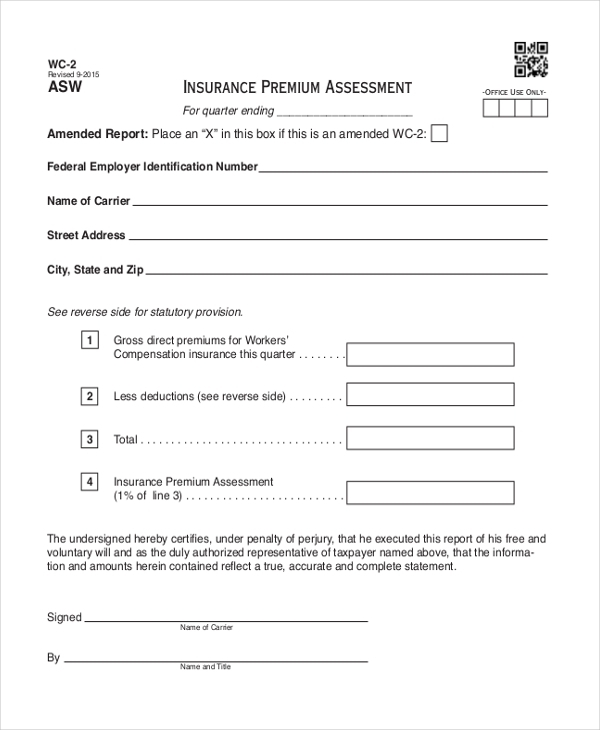 Finding these insurance assessments forms useful for your insurance business or organization? Then choose the most suited self-assessment form from the list that we have suggested above and get it downloaded instantly online. Most of these are available in PDF format that you can customize with your personalized text, business name, logo and also for your business needs.